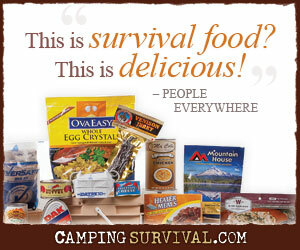 Survival situations can appear unexpectedly and without warning to even the most skilled prepper. During a short 3-hour recreational outing, your canoe comes loose and drifts down river, carrying with it all of the gear you’d brought along. Now you’re stuck, miles from civilization, with little more than the clothes on your back. Or perhaps you accidentally stray off course during an afternoon hike. You hadn’t planned to spend the night in the woods, but now it looks like you may have no choice. Those who have prepared mentally, physically, and emotionally will rise to the occasion. Those who haven’t, face a long and often terrifying ordeal. In either case, what should you do first? When thrust into a survival situation, many people immediately panic. Their heart rate increases as adrenaline is released into their system. They walk faster. They know that help is right around the bend if only they can get there. Most often they are wrong. Instead of rushing around desperately trying to find your way out, it’s important to calm down and assess the situation. Take a few minutes to slow your breathing and collect your thoughts. Consider the situation and plan your next steps. There’s an old saying in survivalist circles. I believe it may have originated in the Air Force Survival, Evasion, Resistance and Escape (SERE) program. It’s called the Rule of Three. The Rule of Three helps you to remember the most important and prioritize the most urgent needs that you may have when in a survival situation. Three minutes without air. The first thing to consider is your immediate safety. You can escape from a burning home or sinking vessel, but you must act quickly and without panic. Three hours without shelter. In harsh environments, the body will begin to protect itself as best it can. Bitter cold or extreme heat can reek havoc on your survival plans as your body attempts to self-regulate its core temperature. In these cases, shelter must be a top priority. Three days without water. Despite, or perhaps because, the human body is approximately 50% water, we need a constant supply of fresh drinking water to survive. The average person should consume at least two liters per day. Three weeks without food. Food, typically the first concern for the reluctant survivalist, is actually much less important than the other, more pressing items. Only three seconds without hope. Everything else is irrelevant without hope. If you lose the will to live, all of the skill and know-how are worthless to you. The Rule of Three is not set in stone. There may be situations where finding water is more important than building a shelter. Every survival situation is different and you must use the most important tool you have with you at all times – your brain. Memorize the rule, but be flexible. Adjust and adapt as the situation demands. But at all times, keep hope. That’s the one thing you cannot live without. The age old “Rule of Three” good rule of thumb for planning a bug out again or a home disaster kit. Air, shelter, water, food; focus on these areas first. It seems like common sense, but I’ve seen many kits where the focus is on weapons, ammo, and high tech gadgets. Making several cellular CPA campaigns also makes it possible for you to obtain a far more broad salary.